Delivering analytical air testing services to the contaminated land and land remediation sector has become a significant part of the services we offer. 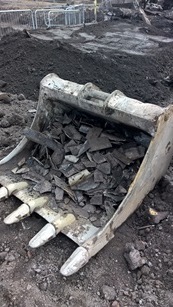 We can conduct background site perimeter monitoring, reassurance monitoring and also visual assessments and identification of Asbestos Containing Materials (ACM’s) during ground and excavation works. In addition we can help develop and review both Clients and Contractors Risk Assessments and Method Statements, as well as undertake personal monitoring of operatives and ground-workers to ensure control measures are effective and that the RPE/PPE worn is suitable for the task.